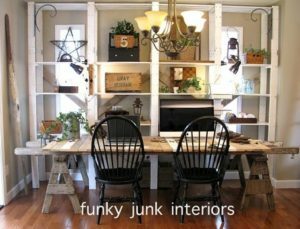 Weathered, rustic, and barn yard chic are some of the hottest trends in home décor. Homeowners and designers pay top dollar for brand new furniture and décor that is designed to look old. Why not make furniture and décor out of wood that actually IS old? Old wood is usually pretty easy to come by. A dilapidated fence, an old barn, finding weathered wood in need of a new home is the easy part. While restoring old wood take a little more work, it brings character, charm, and personality to your piece and gives a story to tell. 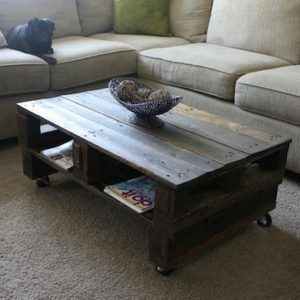 A coffee table redo with reclaimed wood provides a beautiful centerpiece and a conversation starter. For a bigger project, this kitchen table is created from reclaimed wood of several different colored and textures. The legs of the table are reclaimed saw horses in a whitewash finish to create an organic and unique gathering place for family and friends. 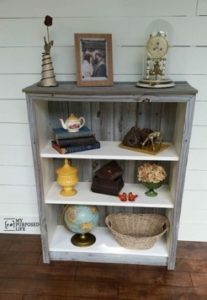 A lot of DIY-ers, (myself included) have spent hours trying to take a new product and making it look weathered, or old. Actually taking something that is weathered and old is a much more authentic process, and creates a beautiful product. Even a basic bookshelf can be enhanced with old wood added to enhance the look of the piece while maintaining the original functionality. 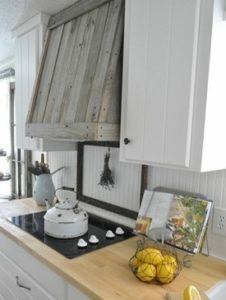 Additional functionality can be combined with old wood to bring beauty to some of the basic areas of your home like this range hood from weathered wood. Start by preparing the surface, but be gentle. Clean thoroughly and scrape any existing paint by hand. If the wood appears to have any rot, it must be removed and patched with a wood plug. Once the piece is clean, sanded, and ready for paint, use a good quality primer. While primer can sometimes be skipped, it is a must have when working with weathered wood because it provides a clean and uniform application. Without a primer, the top coat is more susceptible to flaking. Weathered wood can be painted, stained, or simply sealed with a clear coat for an authentic finish. Use this inspiration to create your own work of art and share it with us. My living room is going to have a beautiful, natural, rustic theme to it! The project of creating a kitchen table out of reclaimed wood is brilliant. I love how it gives variety through color and texture. Along with starting on a homemade rustic table, I am going to find a place that can provide me with rustic chairs. I want my chairs to have the same type of freedom as the table, but to also be very comfortable.